It’s been another incredible week at AWS Re:Invent. Long gone are the days when the most exciting new service they announced was a new instance size — it’s hard to find a service announcement that doesn’t involve machine learning or artificial intelligence, and it’s clear that AWS is moving up the stack. We sat down with our senior engineers and security experts to talk about the services they’re most excited about — and what that could mean for the companies we work with. AWS Fargate is a fully managed container service that allows you to run containers on EC2 without having to manage instances or clusters. This is welcome news to customers have been responsible for managing the underlying capacity, availability, etc. Pricing: Price per vCPU is $0.0506 per hour and per GB memory is $0.0127 per hour. Many of our customers run Kubernetes on AWS. But this has never been the easiest process, and has always required a lot of manual configuration and resulted in some difficult challenges. That changes with the introduction of Elastic Container Service for Kubernetes (EKS for short). EKS allows you to run a managed Kubernetes master tier within your AWS cloud. Amazon EKS automatically runs Kubernetes with three masters across three AZs, and automatically detects and replaces unhealthy masters. Kubernetes already integrates natively with Elastic Load Balancing, Security Groups, and VPCs, so that your engineers no longer have to custom engineer a solution. Although this announcement didn’t make the big headlines, it’s very big news for anyone running Aurora. Amazon Aurora Serverless in an auto-scaling configuration for Aurora that allows you to run your database in the cloud without managing any database instances. It’s perfect for workloads that have intermittent usage, as it can start up, shut down, and scale up or down based on your application. “Aurora Serverless continues the AWS tradition of bringing cost-saving measures to every tier of the application stack,” Christensen says. AWS Guard Duty is a security service capable of detecting suspicious traffic and API activity in customers’ AWS environments. It uses the power of machine learning to detect anomalous behavior and alert customers for certain classes of potentially malicious activity. Logicworks is an official launch partner of Guard Duty, and customers that work with Logicworks will get access to AWS Guard Duty automatically through its cloud management platform, which will centralize data from AWS Guard Duty and allow customers to easily control how notifications will be distributed. Perhaps the most widely-discussed announcement out of Re:Invent, Amazon SageMaker is yet another service that packages together all of AWS’ previously-announced machine learning capabilities into an easy-to-use, fully-managed service. SageMaker is designed to empower any developer to use machine learning, making it easy to build and train models and deploy them to production. It’s one-click machine learning for the masses. 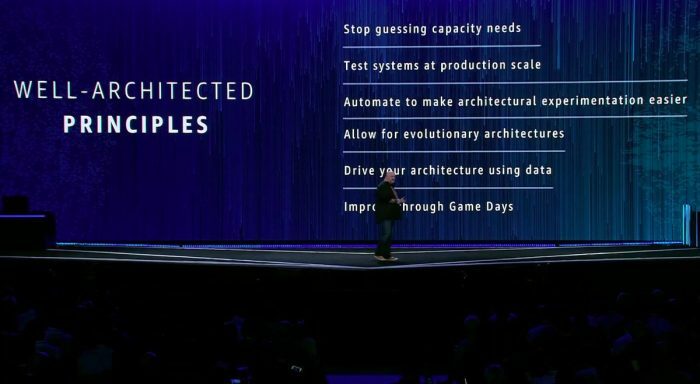 In the midst of such impressive service announcements, it’s remarkable how much air-time Amazon devoted to reviewing AWS Well-Architected during Werner’s keynote. Most attendees (and most enterprises) already have some applications up and running on AWS. Migration is no longer the big story. 2018 will be all about maturing your AWS deployments and taking full advantage of the efficiencies of the cloud. And when your cloud environment (and AWS itself) constantly change, that means continuous review and optimization. Yet another indication that AWS is obsessed with customer value — and that means making sure their customers are running efficiently, even if it means alerting them when they’re overpaying. AWS is heavily encouraging its customers to conduct quarterly or bi-annual Well-Architected Reviews. It’s a formal process that is performed by AWS Professional Services and a limited number of approved Well-Architected Framework delivery partners, including Logicworks. We regularly find that a Well-Architected Review will uncover thousands of dollars of wasted resources, over-provisioned servers, and opportunities for further cost efficiencies, not to mention security vulnerabilities and scaling misconfigurations. It only takes a few weeks and can dramatically improve the value of AWS to a company. AWS Re:Invent 2017 proved yet again that Amazon is at the top of the cloud game. AWS no longer wants to be an IaaS provider where you can get on-demand compute and storage, but a provider of business functions. Let us know if Logicworks can help you get the most out of these new services.